4 Quart Dutch ovens are very versatile and can be used for many kinds of cooking. They can be used on the stove top, on a camp fire or in the oven. They hold their temperature for a long time and are therefore very good for use in any kind of cooking. The Lodge 4 quart Pro Logic is a very popular Dutch oven That comes pre-seasoned and therefore ready to use. One of the features is the self basting lid that makes it that you do not have to open the Dutch oven all the time. Although this is not exactly a 4 QT Dutch oven we still added it to this review page. The most important feature is that the inside and outside is porcelain enameled. The other nice feature is the self basting cover. This makes all the vaporized drippings fall back on the food without you having to lift the lid and do it yourself. Just to be sure. You must realize that hand-washing is recommended for this Lodge 4 QT Dutch oven. the color is called Island spice red. “I was skeptical about buying this because my other two cast iron pots are Le Creuset and Staub, and honestly, there is a certain snobbery with owning such pricey pots – I had to overcome my bias. I needed this middle size, and ALMOST bought a Staub, but then decided to go with this one just to see what I thought. I bought the red one. As soon as it came I washed it and braised a whole chicken in rosemary, pears, and leeks. This Lodge Dutch oven measures a diameter of 10 inch and is 3.5 inch deep. The lid can be used as a griddle and the whole Dutch oven is pre-seasoned and ready to go. This made in the USA product is great for a campfire or in the fireplace, but also can be used in the oven. ” chose this oven because I’ve cooked for years in cast iron, and love the results. Lately I have gotten into camp cooking over a campfire or charcoal with them, and the food and cleanup is amazing. Better than any pre-coated cookware by far. Just like many of the top brands that you pay a lot more for, this King Kooker comes pre-seasoned and is the cast iron lid included. 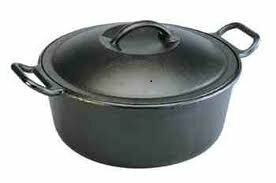 Read from real user that they like to use this Dutch oven for soups, stews and gumblo. 1 mentioned that she love to use it for Gumbo. Also great for deep frying and as a roaster oven. 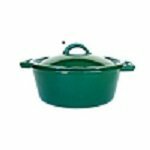 4 Quart Enamel cast iron with a black interior and Green exterior. Measures 10.5 in diameter and 4 inch deep. This Cuisinart hard anodized nonstick 4 quart Dutch oven comes witha cover and is made of 70% recycled material. The perfect fitting lid keeps the heat and moisture in the pan. Handles that stay cool makes it easy to use. Must be hand washed, but can handle heat up to 500 degrees and therefore can be used in the broiler. More reviews will be added to the 4 QT Dutch oven reviews page almost on a daily basis. We only review Dutch oven with a good customer rating and that get good comments. To be honest it seem that the Lodge is in the top with their 4 quart Dutch ovens. Read that some people use a 4 Qt Dutch oven for camping, but also as a back up for if the power goes out. They use it either on the gas or charcoal grill then. Most people think this is the perfect size for stews, and soups. Need a little bigger Dutch oven?